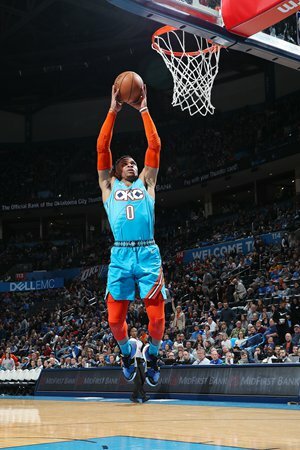 Russell Westbrook tallied 24 points and 10 rebounds and reserve guard Dennis Schroder scored all 10 points in the second half as the Oklahoma City Thunder defeated the San Antonio Spurs 122-112 on Saturday. The Thunder rallied from a nine-point halftime ­deficit to seize control of the contest in the third quarter and avenge a 154-147 double-overtime loss to the Spurs two nights ago. "They didn't let me play," Aldridge said. "They ­doubled me in every way. They came from the baseline, from the top. They made sure that the ball wasn't in my hands." Elsewhere, Blake Griffin made an turbulent return to the Staples Center, scoring 44 points as the Detroit Pistons toppled the Los Angeles Clippers 109-104. It was an emotional day for Griffin as he snubbed Clippers owner Steve Ballmer before the game, was greeted with a standing ovation during a first-quarter video tribute, and then had a heated exchange on the floor with former teammate Patrick Beverley as the final horn sounded. The former first overall draft pick by the Clippers in 2009 was surprisingly traded to Detroit last January ­after signing a five-year extension worth $171 million. Griffin averaged 21.6 points, 9.3 rebounds and 4.2 assists in eight seasons in Los Angeles. He won the rookie of the year award and was a five-time All-Star with the franchise. Before the game, Clippers owner Ballmer waited on the sidelines and then extended his hand for a handshake, but Griffin ignored him, sprinting off to the ­locker room. After the game, Griffin scolded a reporter for mentioning the snub on social media, saying he was just conducting his pre-game routine. Asked if he would ever shake Ballmer's hand, Griffin bristled, saying, "I am not here to answer hypothetical questions."